I daily read a lot of blog posts. To keep up with what’s happening in the ruby/linux community and what’s the latests buzz in the webdeveloper world. I’m now using google to keep track of the RSS feeds. I’ve used some desktop applications in the past (like rssowl and liferea). I think I’ll switch to a desktop application again. Liferea has the nicest gui. So I think about using that one. I also found Blam! and Straw. 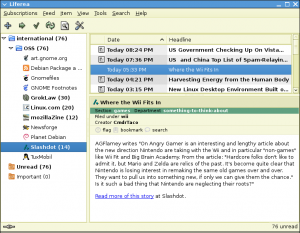 But blam looks very gtk1-ish and the news for Straw hasn’t been updated in 4 months and has no screenshots. And you have to have good documentation as an open source project.